ChemDraw ultra 12.0 incluye a Chem3D pro 12.0, así como también incluye características a ChemDraw ultra como Struct=Name, ChemNMR, la base de datos Gateway livelink, Chem3D livelink, Clogp/CMR, una gradilla de Estequiometría, ChemDraw/Excel y ChemBioFinder Office (W) a ChemDraw pro 12.0. 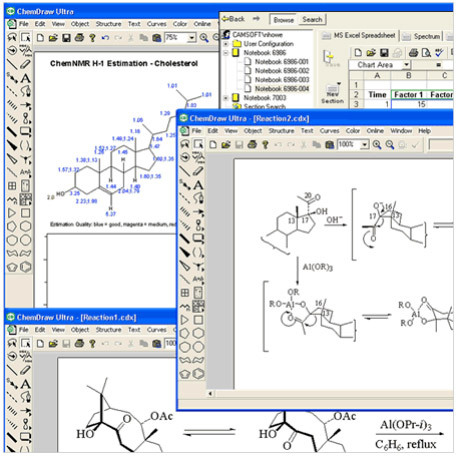 ChemDraw has long since been recognized as the industry’s leading application for chemical structure drawing. Sequence Tool, 13C and 1H NMR prediction with peak splitting and highlighting, a TLC plate drawing tool, Struct<=>Name, ChemDraw/Excel, Stoichiometric analysis, property predictions live-linked to the structure, a live-linked Database Gateway, Fragmentation tools, 3D structures live-linked to the 2D structure and more! ChemDraw also offers a number of customization options such as custom Nicknames, Templates, HotKeys and even newly added ChemDraw Themes. ChemBioFinder Std is a database management system appropriate for anyone who works with chemical information and chemical structure databases. browse, create, search, and update databases with structural, numeric, and text data via user-customizable forms, including structural and sub-structural queries, as well as linking to related data in sub-forms. View and edit structures in a variety of modes, automatically create databases and forms for imported data, export and print. This premier ActiveX Control/plugin allows you to query online databases and view & publish online structures. This installer will automatically install the necessary plugin or ActiveX controls based on your web browser(s). This premier ActiveX Control/plugin allows you to view & publish 3D structures online and in MS powerpoint presentations. This installer will automatically install the necessary plugin or ActiveX controls based on your web browser(s). It adds save and print abilities to Chem3D ActiveX/plugin Net. ChemDraw/Excel allows the user to create chemically knowledgeable spreadsheets within the familiar Microsoft Excel environment. You can build and manipulate chemical structures within Excel, compute chemical properties and perform database searches. ChemNMR can be used to accurately estimate 13C and 1H (proton) chemical shifts. The molecule and the spectrum appear in a new window. The chemical shifts are displayed on the molecule and the spectrum is linked to the structure so that clicking on a peak in the spectrum highlights the related fragment on the molecule. Generate systematic names for chemical structures with support for the Cahn-Ingold-prelog rules for stereochemistry. Struct = Name produces names from structures and structures from names. Chemical naming includes support for many more types of compounds, including charged compounds and salts, highly symmetric structures, many types of inorganic and organometallic compounds, and others. This product is ChemDraw Std plus the Struct = Name feature.